Someone work at the patch ? Probably no, because all the patch creators playing in china version. ill start on working on thai patch tomorrow as the same time i continue the chinese one. I am hoping that this is still being worked on, especially since there is a lot already in English. Would love to know the progress on it, if its still being worked on. Update: Ah, I tried it. 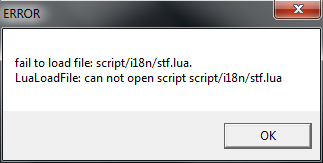 I get an error when I launch. @#RealTalk , then why did u put that link? Hopefully you can fine tune it to work completely. it just doesn't work man! thats for the chinese version of the game. so idk how its even working in the first place. if you have like edited it to work on the thai version why not grab lis's patch which is further along and make that one work on the Thai version? well we hope for the best!